HOUSTON – After a busy week at the International Space Station, the six-astronaut crew of NASA's shuttle Endeavour enjoyed some time off Tuesday (May 24) to rest up at the halfway mark of their long space trek. The off-duty time gave shuttle commander Mark Kelly, pilot Greg Johnson and mission specialists Greg Chamitoff, Mike Fincke, Andrew Feustel and Roberto Vittori some time to reflect on the milestones of their 16-day mission, which is NASA's final flight of Endeavour before the shuttle is retired this year. "This is it for Endeavour," Kelly said. "After we land back in Florida, Endeavour will head off to a museum, so it's kind of sad. This mission — we're halfway through it today. Endeavour has to perform really, really well for us. And it has so far. This is an incredible ship." A short time before they donned spacesuits for a spacewalk, NASA astronauts Michael Fincke (left) and Andrew Feustel, both STS-134 mission specialists, are seen eating breakfast snacks onboard the International Space Station (ISS) on May 22, 2011 during Flight Day 7 of their 16-day mission. The mission's second spacewalk, which was conducted by Feustel and Finke on May 22, lasted more than eight hours, making it the sixth-longest in history. Today, the crew prepared the equipment and procedures for the next spacewalk, which Feustel and Fincke will begin Wednesday (May 25) at 1:46 a.m. EDT (0546 GMT). The mission has been running smoothly so far, Fincke said. "Endeavour is a beautiful bird," Fincke said. "It's taking us through our mission step by step with very few problems, if any. She's doing great and she saved her best for last." Yesterday, the shuttle crew enjoyed some more off-duty time, as preparations were underway for three space station residents to journey back to Earth. It was the first time a Soyuz spacecraft undocked from the space station while one of NASA's space shuttles was also parked at the orbiting outpost. To mark the occasion, and to gather some interesting engineering data, Nespoli photographed the shuttle and International Space Station from a distance of about 656 feet (200 meters) after the Soyuz initially backed away. "What we've communicated to the shuttle crew is that there's no requirement for them to be awake," lead station flight director Derek Hassman explained before the undocking. "There's no expectation or requirement that they be awake, but we did put a message onboard about which windows have good views and cameras. We're leaving it up to their discretion. If it was me, I'd be awake for a couple hours." 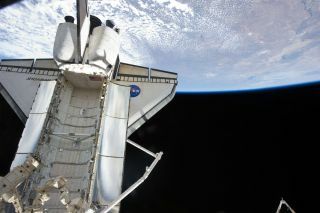 NASA expects to release the high-resolution images and video of Endeavour and the space station sometime today. Endeavour is slated to return to Earth on June 1 to end its STS-134 mission, which is the 25th and last flight for the shuttle. NASA is retiring all three of its space shuttles after 30 years of service to make way for future deep space exploration of asteroids and, eventually, Mars. Endeavour, like its sister ships, will eventually be placed on public display at a museum after it flies its final mission.